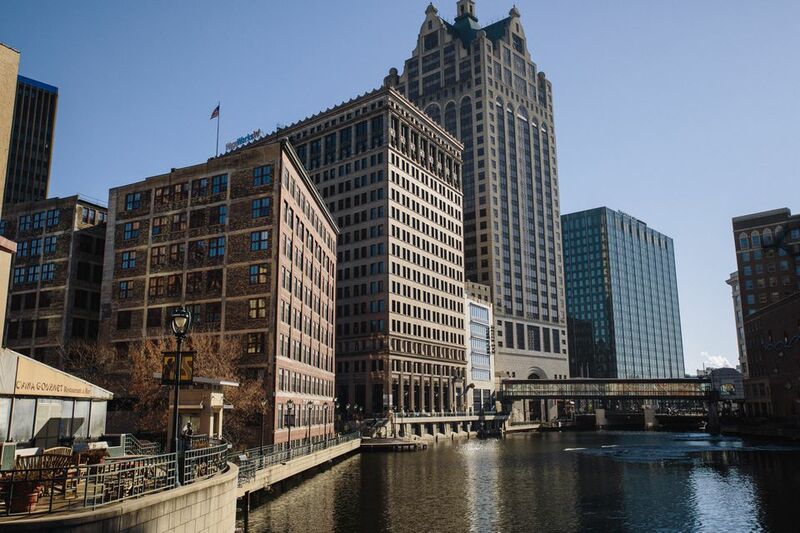 Despite being Wisconsin’s largest city, Milwaukee is often overlooked by Chicago and yet there is a vibrant farm-to-table dining scene, lots of outdoor spaces along Lake Michigan, and a thriving downtown filled with options for shopping, live music and bar-crawling (next up: a new Westin hotel, opening this summer). Arriving on a Friday? Bite into one of the city’s food traditions: a fish fry. On Friday evenings, Lakefront Brewery on the East Side not only serves a fish fry but it’s to the tune of live polka, another Wisconsin tradition. Get your bearings of the city by sipping a cocktail at The Outsider, a rooftop bar on top of the Journeyman Hotel, in the Third Ward, before you head out on the town. Milwaukee’s downtown is blessed with a shoreline, and many first-time visitors to Milwaukee don’t realize just how big of a body this Great Lake is. Short of waist-high waves, you might mistake it for the ocean. Stroll along the shoreline via Lincoln Memorial Drive and its companion paved pedestrian path from the south side of downtown (where Discovery World and the Milwaukee Art Museum are) as far north as the University of Wisconsin-Milwaukee’s campus. You can rent a Bublr bike from various stations in downtown Milwaukee if you want to explore it all and have limited time. Grab a cup of coffee or a casual breakfast at Colectivo Coffee’s lakefront café, in the shell of a former wastewater treatment facility, and if you’ve got time, do duck up the roadside to Brady Street for Italian cookies and cappuccino. In winter, so long as it’s not too frigid or icy, it’s not uncommon to see locals in Lake Park, which is above Lincoln Memorial Drive, on cross-country skis or snowshoes, which you can rent at Urban Ecology Center nearby. Since it opened in 2001, Santiago Calatrava’s first North American installation has put Milwaukee on the map as a design destination. See it for yourself at the Milwaukee Art Museum, where Calatrava’s white wings atop the Quadracci Pavilion are a focal point along the skyline. Natural light abounds inside, as does an impressive permanent collection of Haitian art, folk art and works from famed artists like Georgia O’Keefe and Andy Warhol. There are rotating exhibits, too, including this summer’s on Frank Lloyd Wright. After the museum, take a happy-hour break at Harbor House next door. The restaurant juts out into the water—and thanks to a wall of windows you can spot the Milwaukee Art Museum with ease. From 4 p.m. to 6 p.m. weekdays, the food and drink specials at this high-end seafood-focused restaurant are nearly half off. Warm out? Take a seat on the Adirondack chairs on the patio. But even in winter, the restaurant’s interior space is a cozy place to be. Milwaukee’s version of Brooklyn, N.Y., is the Bay View neighborhood, about a 10-minute drive south of downtown Milwaukee. Hit up one of the hot restaurants here (Odd Duck or Goodkind are two that have opened within the past few years, with farm-to-table fare and many shareable small plates). After dinner, either order drinks at At Random, a throwback cocktail lounge serving ice-cream drinks and other retro concoctions, complete with leather half-moon-shaped booths, dim lights and Sinatra’s tunes; or check out the theater. The Avalon Theater reopened along South Kinnickinnic Avenue (the neighborhood’s main drag) within the last two years, showing first-run movies in a completely refurbished—but still historic—environment. You can even order food and drinks and have them brought to your seat. While there are many great dining destinations in Milwaukee, Walker’s Point—which used to be vacant warehouses and home to now-shuttered industrial factories, just five minutes south of downtown Milwaukee by car—is now a food paradise. If it’s a Sunday, start with “The Great Northern Brunch” at Smyth, inside the Iron Horse Hotel, a menu inspired by U.S. regions from coast to coast. A good breakfast is offered at Smyth daily, including “The Wisconsin Classic,” three scrambled eggs, muenster cheese, Usinger sausage, pretzel bread and German mustard sour cream. Next, check out the fuss surrounding cheese curds by picking up a bag, and maybe even seeing how they’re made, at Clock Shadow Creamery (http://www.clockshadowcreamery.com), one of the country’s few urban creameries. Also in the neighborhood are two craft breweries: MobCraft and Milwaukee Brewing Co. Both offer tours and tastings. Satisfy your sweet tooth with a cone of Purple Door Ice Cream (its unique flavors include Whiskey) at its lone retail space or pick up Indulgence Chocolatier’s bars of chocolate as souvenirs. Head out of downtown and pull yourself away from the stunning lakefront to see some green space. Boerner Botanical Gardens is in Hales Corners, about a 35-minute drive from downtown Milwaukee, and one of the best botanical gardens in the Midwest. If sculpture art is more your thing, head to Lynden Sculpture Garden, which is about the same drive as to Hales Corners, and still in the city of Milwaukee, near where I-43 meets West Brown Deer Road. Its 40 acres are open year-round and filled with ponds, sculpture art and rotating exhibits, a grand place to work off all the food you ate earlier in Walker’s Point. Get a taste of Milwaukee—in one meal—when you visit the Milwaukee Public Market, a series of food and beverage vendors much like Chelsea Market in New York City or Pike Place Market in Seattle. Whether you crave a lobster roll or a taco, or sushi or a red-velvet cupcake, it’s all here. Grab a table at Thief Wine Shop & Bar in the middle of the market and you can bring food in from any vendor at no extra cost, pairing your bites with a line-up of boutique wines by the glass. While you’re in the Third Ward—which reminds of New York City’s SoHo for its renovated brick warehouses—check out the numerous boutiques (selling clothing, antiques and home-décor items) and art galleries. This is the most arts-centric neighborhood in Milwaukee, which is why the Third Ward hosts the quarterly Gallery Night & Day (held on the third Friday and Saturday of the month in January, April, July ​and October). Don’t turn in just yet! The Third Ward is home to quite a few live-music venues, such as Milwaukee Ale House (bonus: you get to try hometown brew), The Wicked Hop and—nearby in Walker’s Point—Caroline’s Jazz Club. More of a theater fan? Check out a play or musical in the Skylight Music Theatre.